Eliminate blocks to help the miner dig for gold. Gold Strike, the popular Web-based action/puzzle game has been around for more than a decade and has been played by millions. Now it you can play it on your iPhone, iPod touch or iPad! You are miner who has struck gold! But the mine is unstable. 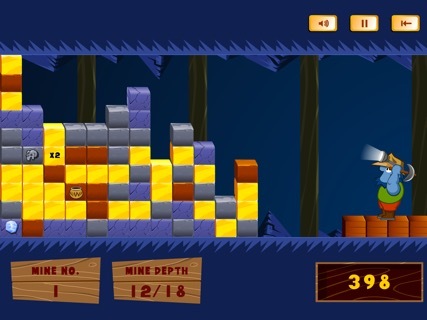 Remove gold by finding groups of blocks as tremors fill the mine up. • Bottomless Pit: One level that keeps going until the mine fills up. • Strategy: Blocks only advance manually or when you remove some gold. • Dynomite: Use explosions to get to higher levels. 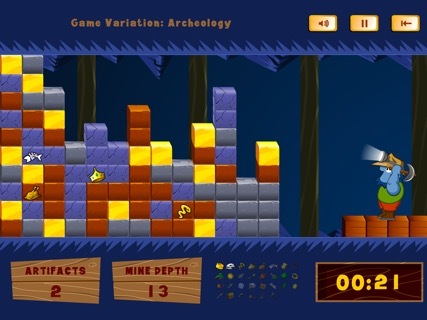 • Archeology: Find 30 artifacts before the mine fills up.